Detail from OSD 316, showing Wrexham and Erddig ('Erthig') Wood to the south. 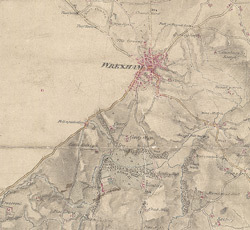 The area to the west of Wrexham is not shown on this sheet. The whole plan follows the meandering River Dee from Chester, at the top of the map, to Overton and Ruabon, at the bottom left. A section of the Shropshire Union Canal, running from Chester to Waverton, is shown in blue. At the bottom left of the map, an area calculation table survives in black ink. The pencil gridlines running through Chester were most likely guides for making enlarged or reduced copies of the map.